As much as I absolutely love photography, I hate searching for space. 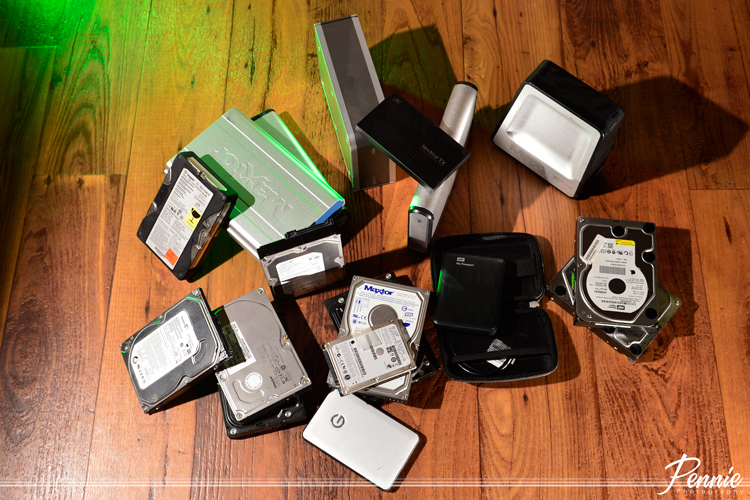 Any digital photographer would agree, you can run out of space very quickly. Each of my shoots can utilizing a 8-32 gigs of space. So lets say I shot, 3 to 5 model or portrait sessions in a week, that would be anywhere from 32 - 94 gigs in a week. YEEEAAA, not really. Keep in mind I'm only speaking of unedited imagery. In a months time, that's anywhere from 400 gigs up to and to a terabyte (a lot of damn room). Regardless of what you use, your computers hard drive or external hard drive(s), it's imperative to backup everything you have to at least 2 additional locations. CD, DVD, Blue-ray, another external, cloud or server it doesn't really matter just back it up. I find this a little odd but there are some photographers that purchase new memory cards for each shoot!!! Hey if it works for you then do it. So it looks as if it's time for me to upgrade from external drives and migrate to a complete raid system. It's a little pricy but at least I can't tell you........."there was accident and my (strange animal's name here) ate my memory card, which had your images on it. So....yeahhhhh"
So my internet search continues for the right choice.